A wilting wave of humidity is making it feel like summer outside, but I'm not ready to breeze by spring that fast! Natasha from Joy For Toes captured the season's essence in cool greens. 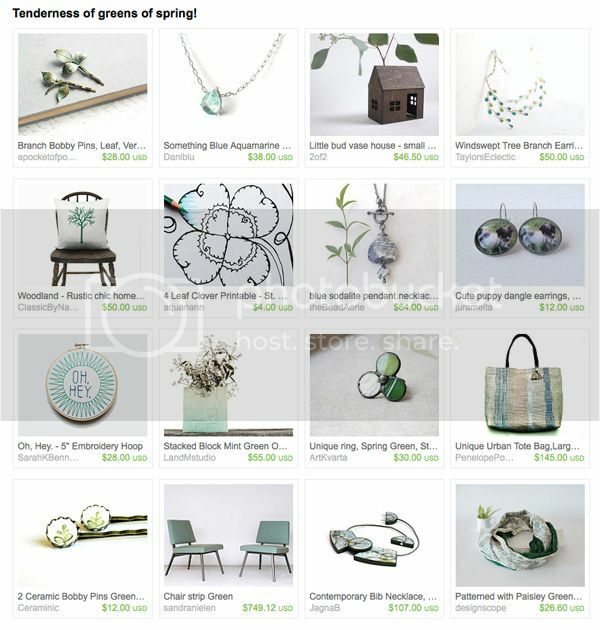 Her nature gift ideas include verdigris green leaf bobby pins by A Pocket of Posies Jewelry, windswept tree branch earrings by Taylor Twigg and my four leaf clover line art coloring page. Refreshing treasury, which is more than I can say for our weather. Down here in southern Florida Spring sprung right by us and dropped us smack dab into Summer. It is 92 degrees out on our Patio now . . . and this is only the first part of May ! I don't want to even think about what July and August are going to be like. Love the colors and theme! I'm obsessed with mint green! I like this minty collection. Very nice! They are all beautiful and remind me of spring! Have a terrific day! Gorgeous treasury Kristin! You did a fantastic job! I love this treasury so much! So well done! !